Scott Heinrichs calls his organization the “Flying Fox Conservation Fund” (FFCF) but is it really conservation? Would a true bat conservationist keep bats in his basement, breed them, pull youngsters off of their mothers and sell them as pets? Unfortunately, this appears to be the real story behind the Flying Fox Conservation Fund. And what Scot Heinrichs, owner of “Flying Fox Conservation Fund, likely doesn’t tell you is that Egyptian fruit bats bond for life; families stay together for life in the wild. Imagine having your 6 year old ripped from your arms and sold to a stranger, never to be seen again – that is the equivalent of what happens when bat pups are pulled off of their mothers and sold for an average of $800 to $2,500 each. 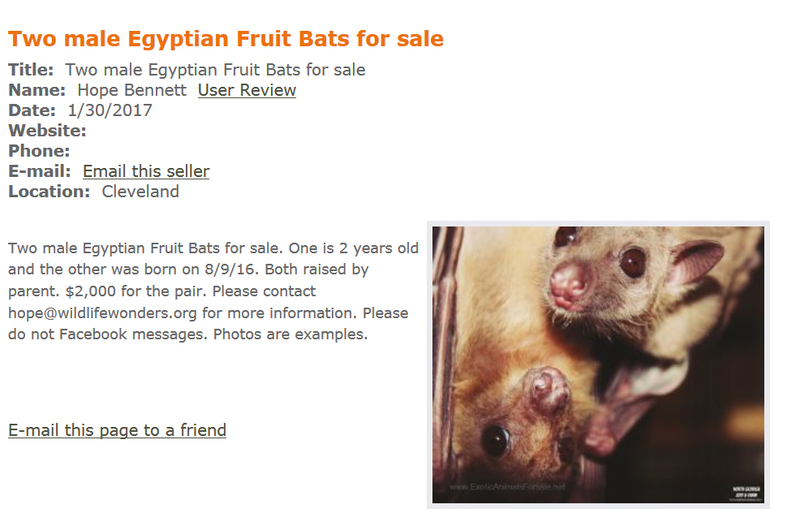 Plus, the buyer is likely not told that the “pet bat” they just bought WILL IN ALL LIKELIHOOD BE DEAD WITHIN A YEAR. 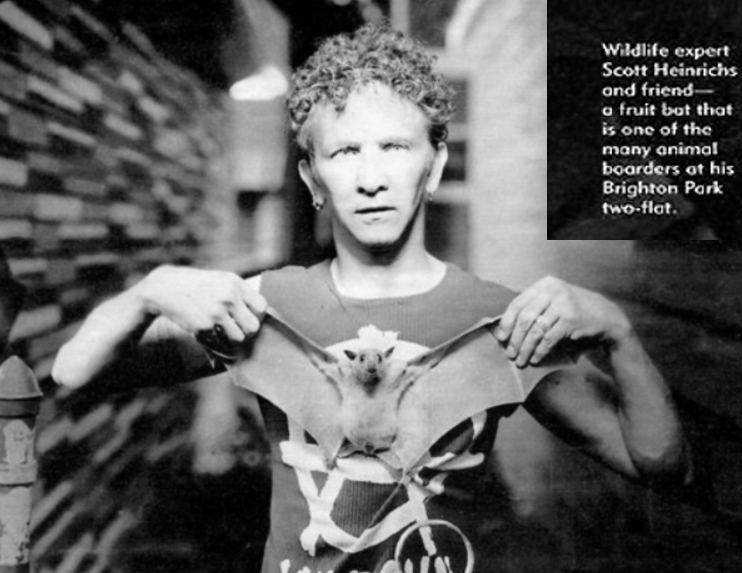 Lastly, this Flying Fox Conservation Fund photo speaks volumes. 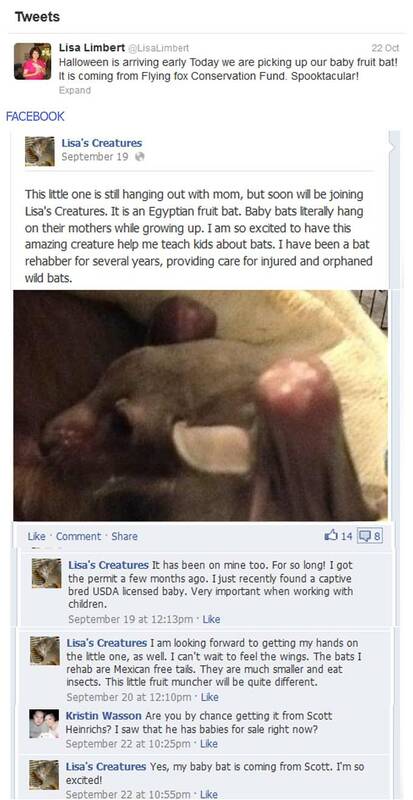 This poor, heavily pregnant fruit bat is being held up by her delicate wings by Scott Heinrichs. If this doesn’t scream total disrespect for an animal the Flying Fox Conservation Fund touts to “conserve” then what does? The “Flying Fox Conservation Fund” is no better than the “Zoological Wildlife Conservation Center” in taking the highest dollar possible for bats at the unsuspecting buyers expense- money wasted on an exotic pet that is doomed to die. Through our ever-popular, live performances, we have shared our knowledge, respect and appreciation for the animals that share our planet. Educating the public and promoting conservation are just a couple of the many ways we show our commitment to the animal kingdom. When local animal control officers are confronted with a dangerous exotic, we’re sent in to rescue the often illegally obtained “pet.” Our fully licensed “Haven” program also accepts most exotic animals (including venomous snakes) from private citizens. We are dedicated to helping those who have discovered that owning this type of “pet” is unfair to the animal, potentially dangerous and far more difficult than they imagined. 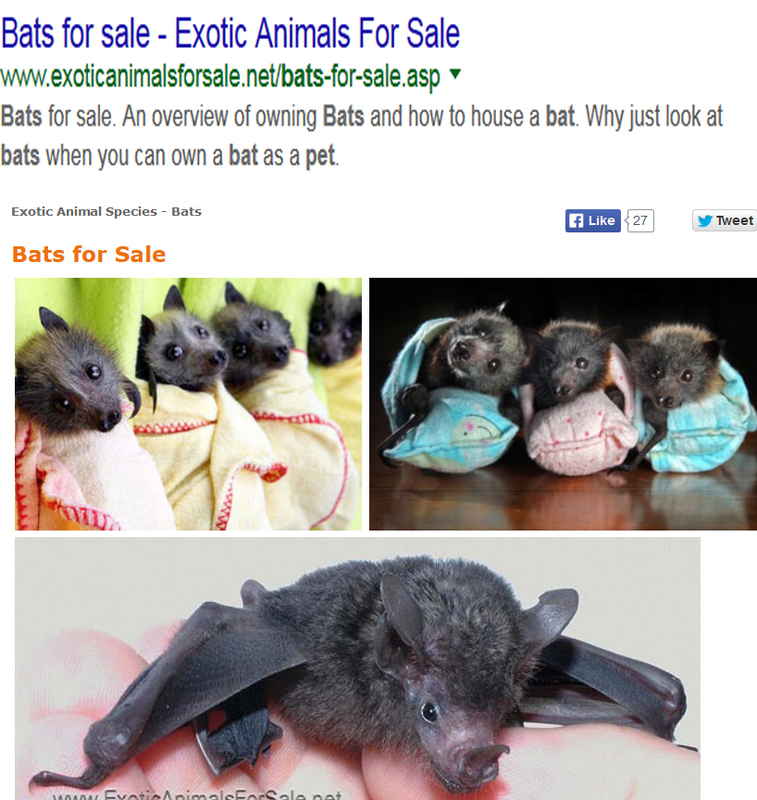 Why then, did they sell this poor bat into the “unfair” and cruel exotic pet trade? It is common knowledge that bats rarely survive more than a year when kept as a pet. 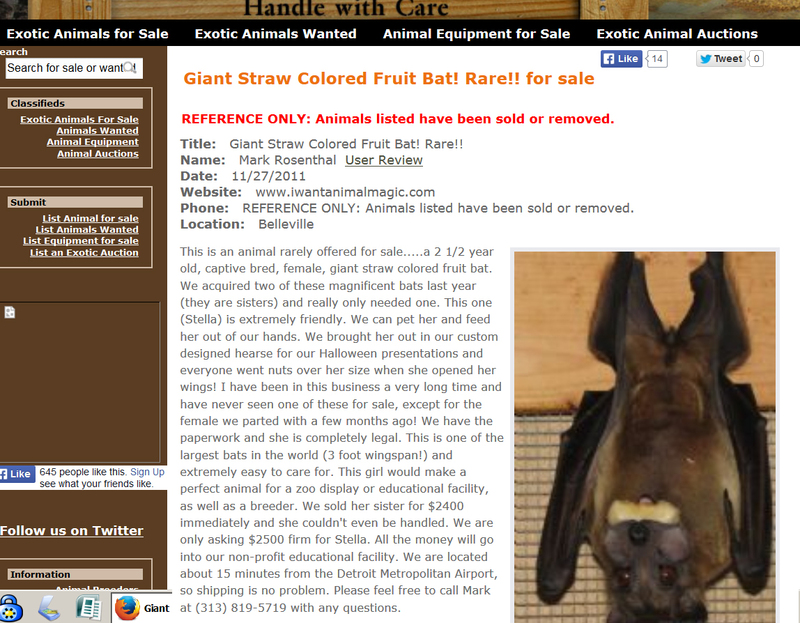 This is an animal rarely offered for sale…..a 2 1/2 year old, captive bred, female, giant straw colored fruit bat. We acquired two of these magnificent bats last year (they are sisters) and really only needed one. This one (Stella) is extremely friendly. It appears that Mark Rosenthal of Animal Magic does not practice what he preaches. 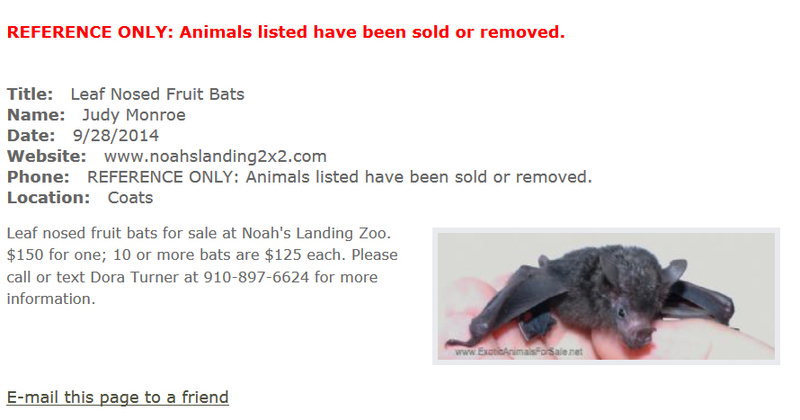 And what Mark Rosenthal likely did not disclose to the buyer is that bats bond for life, families stay together for life in the wild (imagine having your 6 year old ripped from your arms and sold to a stranger, never to be seen again). That is the equivalent of what happens when bat pups are pulled off of their mothers and sold for an average of $800 to $2,500 each. 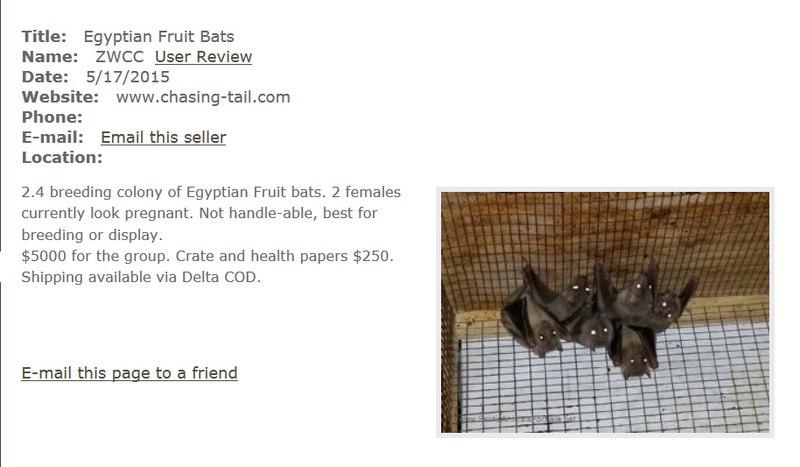 Plus, the buyer was likely not told that the “pet bat” they just bought WILL IN ALL LIKELIHOOD BE DEAD WITHIN A YEAR.